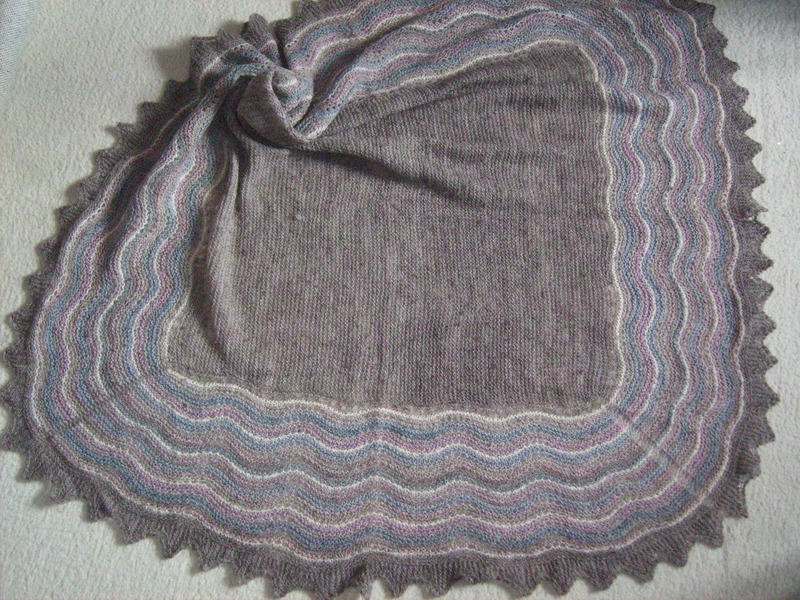 Well, a new baby has arrived in the family and so a new baby shawl has been spun and knitted. Really it should be called a hap. 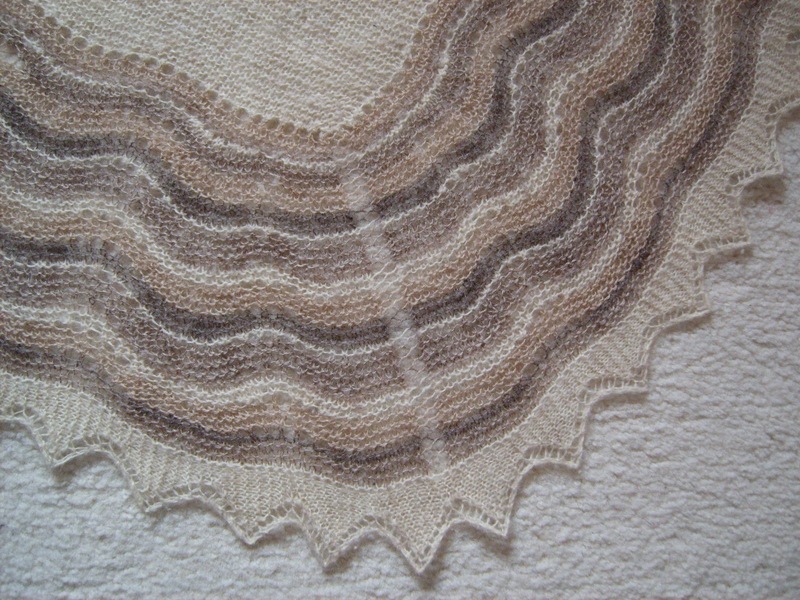 'Hap' means to wrap warmly and so as that is the purpose of a baby shawl then it should be called a hap. Increasingly they are being called shawls but in our family they are still haps. I knitted haps for all my children and then grandchildren as well nieces and nephews and some of their children. I have loved knitting haps ever since I knitted my first one. It is my most favourite thing to knit. I have made one small hap for myself. I mixed black and white fleece to get perfectly shaded greys. It has been used for many years. As a scarf in the winter. Or bundled in a bag and easy to carry on holiday in case of a summer shower or a chill breeze. Really cosy when you feel unwell. The first handspun hap I made (from my first handspun yarn) was started for my middle daughter but only finished for my youngest. So when my middle daughter had her 1st child she asked for a hap. I asked, 'what colour', the reply, 'doesnt matter as long as it is handspun'. Maybe as she didn't have a handspun hap she thought her children should. Spun from a nice soft prize-winning grey fleece. The pink and blue yarn in the stripes was plyed with silk. Including blue and pink made it unisex as we did not know if it was a boy or a girl. Then a second baby was due and she said, 'I need a hap', my response, 'you have one', her response, 'new baby, new hap, it needs its own hap'. And so a second was made. This one was in fawns and we didn't know if this was a boy or girl either so we kept it neutral. We knew this one was a boy, and so it just had to be blue. A very soft fleece with 4 colours of grey and an almost black shade and I had 5 colours to dip in the indigo vat. 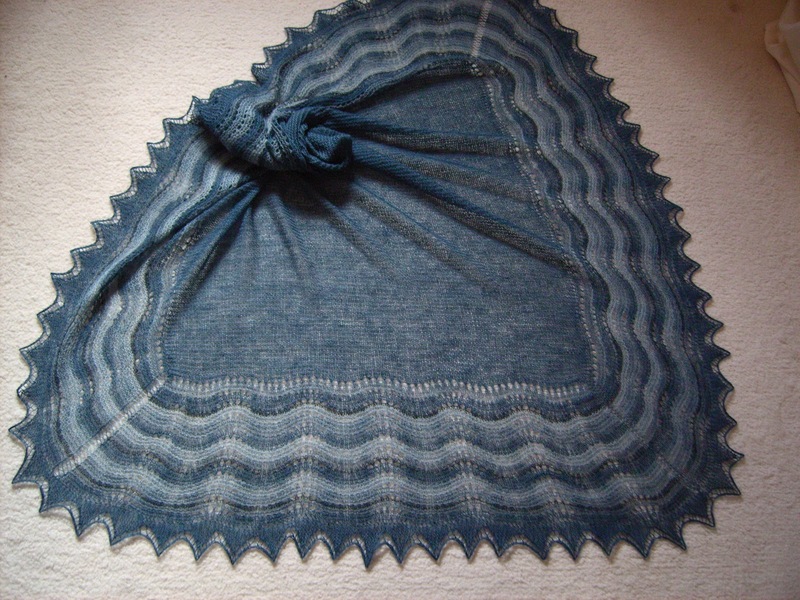 The result was gorgeous shading and something in the indigo seems to make the wool softer. It just felt as if it was melting. ......and now another boy and the order was - light with a little blue if you want. Well, I love blue. 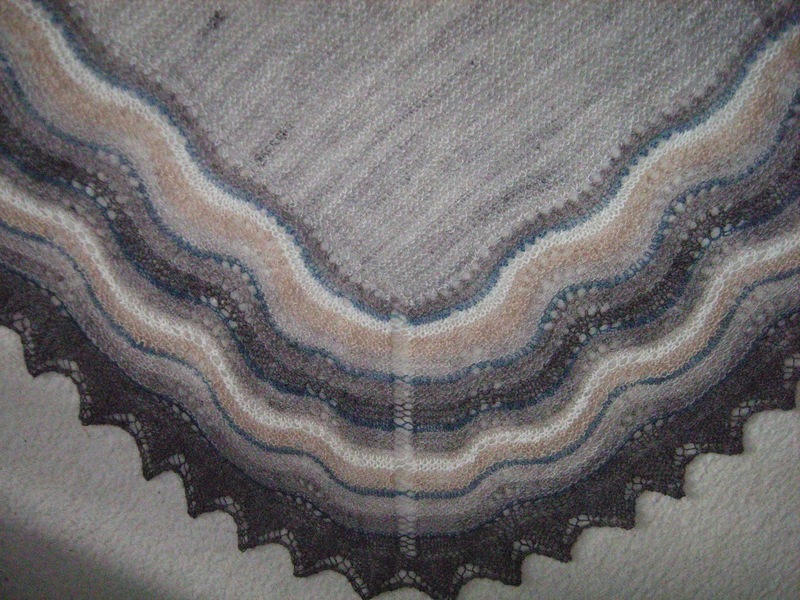 I raided the lace yarn oddments box and found leftovers from the 3 previous haps, two greys from no.1, a fawn from no.2, and little bits of all the blues from no.3 and so with a mid grey and a silver grey spun from a soft and very silky fleece I had the colours for this next hap. These are family haps, but I have made others for sale and for commissions. I will take an order for a hap at any time and enjoy the knitting. 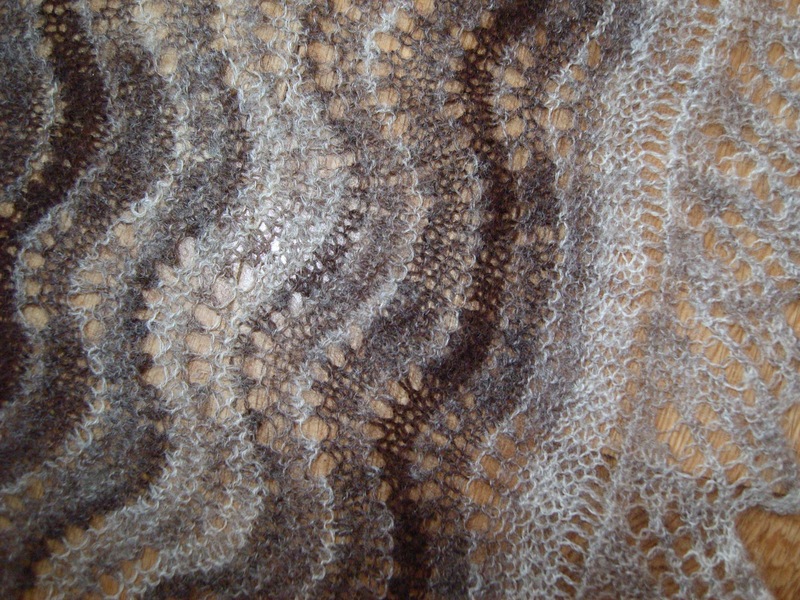 I have a commission for a shawl with madder red yarn. I will post a photo when that one is finished. I am still working on getting the shades of red and orange red correct. But it is looking good. These are so lovely, Elizabeth!! Thank you for posting! I have made two haps so far this year out of my own millspun Shetland wool (from my own sheep). I thoroughly enjoyed the process and can totally understand your making several of them. I still have a bulky handspun one on the needles and would like to make the next one a finer handspun one (need to finish spinning more yarn). I can see making an endless variety of them!